Leading off today: Girard to the rescue, one more time. But in this instance it was Trent Girard rather than Joe Girard III making the clutch play. The senior guard's corner 3-pointer midway through overtime was the crucial spark for Glens Falls in its 77-70 win over South Bronx Prep in Saturday's Federation boys Class B basketball semifinals before 5,910 partisan fans at Cool Insuring Arena. The bucket made the score 73-68 and set off a frenzy. "Right when it left my hands, I started to get back on (defense) because it felt good and I knew it was going in," said Trent Girard, who finished with 13 points. "The place erupted when it when in. It felt like the roof was going to come off. It was one of those shots you dream about as a kid, in overtime, to give your team a cushion." 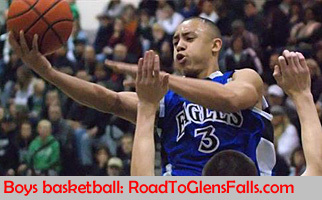 Glens Falls struggled for much of the first three quarters as South Bronx Prep feasted off of second-chance opportunities in the paint. In addition, the PSAL champions were keeping a tight leash on Joe Girard III even as we worked his way toward 42 points with a stronger second half. The state's career scoring leader was 5-for-19 on 3-pointers and rarely found himself holding the ball in settled situations. That's where his cousin made the difference. Aside from the 13 points, Trent Girard chipped in with eight assists in the face of end-to-end pressure, including a dish to Kyle Vachon for the first overtime basket. The Indians will face Cardinal O'Hara in Sunday's title game at Cool Insuring Arena in front of what is expected to be another huge home crowd. O'Hara advanced in a 48-46 squeaker over Lawrence Woodmere Academy, making a late rally from five points down. Justin Hemphill finished with 12 points, 12 rebounds and three assists. LWA's Tyler St. Furcy finished with 18 points, but O'Hara clamped down hard on 6-foot-10 Aidan Igiehon, who finished with five points and five rebounds. The Louisville commit got off just three shot attempts before fouling out. Dominating finale for LuHi: Long Island Lutheran captured its eighth Federation title -- its first in Class AA -- with a 51-31 victory over Christ the King in the boys large-school final. Junior point guard Andre Curbelo scored a game-high 23 points and collected 10 rebounds and five steals. "I've had great teams and together teams, but I've never had a team that was as together as this," said coach John Buck. "They love each other, they don't care who does what, and they play basketball for the right reason -- the joy of the game." The Crusaders went on runs of 13-0 in the first quarter and 20-6 in the fourth. Girls finals: Christ the King (Class AA) and Pittsford Mendon (A) took home the hardware in a pair of exciting championship games. Christ the King rallied from an double-digits deficit and outslugged Ossining 81-76 as the perennial heavyweights of the CHSAA and NYSPHSAA faced off. Christ the King, which got 19 points from Nina Rickards, outscored the Pride 29-21 in the fourth quarter. "That's exactly how I thought it would be," Royals coach Bob Mackey said. "It was a war. Did I think we would be down 10? No." Senior Klarke Sconiers finished with 17 points and 11 rebounds in the win, and Kaelynn Satterfield came through with 13 points, nine rebounds and eight assists. Christ the King needed all of it and more to help negate the damage down by Ossining's Aubrey Griffin, who finished with 38 points but was hampered down the stretch by playing with four fouls. "I think she is the best," Mackey said of the UConn recruit. "We threw the kitchen sink at her. She played 35 minutes yesterday (when she scored 39 points), sat out two minutes today, but we threw so many kids at her, I think she might have gotten a little tired." Trailing by four points with 1:15 left in regulation, Pittsford Mendon opened overtime with an 8-1 run and defeated Staten Island Academy 72-67 in the encore to the Glens Falls-South Bronx Prep barnburner. Courtney Naugle (12 points, six assists) scored the first OT basket for the Vikings and Ellie Mooney followed with a 3-pointer to put the Vikings in control. Mendon outscored SIA 12-7 in the extra session. Senior Alana Fursman, who picked up two fouls and was scoreless in the first half, led the winners with 17 points and nine rebounds. Her basket off a baseline out-of-bounds play with :08.8 left in regulation sent the game to overtime. Emily LaPointe led SIA with 23 points and 10 rebounds. Boys Class A semifinals: Frederick Douglass Academy and Albany Academy will play in Sunday's championship game, a rematch of a holiday tournament game. Frederick Douglass Academy defeated Poughkeepsie 50-42 in the semifinals as 6-9 center Mohammed Wague, an immigrant from Mali, dominated a stretch midway through the second half. After getting only two points and five rebounds in the first half, Wague hit two free throws, put back an offensive rebound, then added a dunk to put FDA within one point entering the fourth quarter. He put back another offensive rebound and hit two more free throws in the fourth. Five of Wague's game-high 13 rebounds were on the offensive. boards. Albany Academy, which beat FDA at a tournament at SUNY Cobleskill, defeated Park School 71-56 to avenge a last-second loss in the 2018 title game. Cadets guard August Mahoney scored a game-high 23 points to send Albany Academy to its fourth straight final.